Blending faded decadence and the thrilling dread of gothic horror, April Genevieve Tucholke weaves a dreamy, twisting contemporary romance, as gorgeously told as it is terrifying—a debut to watch." I have had my eye on this one for a while now. It just sounds amazing! 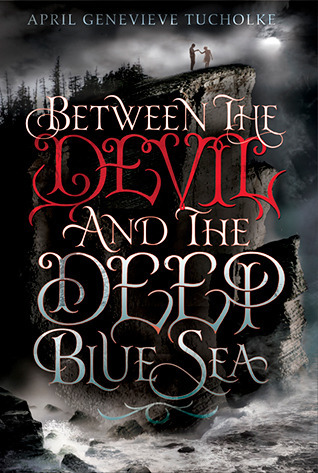 Between The Devil and the Deep Blue Sea will be released on August 15, 2013. Great choice, Teresa! This does look like such an interesting Gothic read. And the reviews are quite good so far! I'm totally dying to read this book, too! It sounds amazing and the cover is gorgeous and kind of creepy but I love it! Great pick and thanks for stopping by my blog! I still need to read the first. Hope you get to read it soon! I waited on this a while ago--it just looks so good! I'm eager to get my hands on it. Thanks for stopping by! I'm so excited for this one, too. It sounds so interesting and I love that cover. Great pick! What a great cover! And the story sounds pretty great too. Thanks for sharing, Teresa. Great choice! I have had this on my tbr for a very long time. I hope we both enjoy it! I have seen this book around a lot! I love the cover and it sounds so good! Great pick Teresa! I actually read this one already. Wasn't a big fan which was sad because I had high hopes for it. Hope you like it! This one sounds SO good! I am also waiting for it! Awesome choice Teresa!